Juni Taisen is, in my opinion, about the worst possible way you can write a battle royale storyline. It’s entirely predictable, and while many battle royales are, that’s because they usually have a clear protagonist, unlike the ensemble cast that Juni Taisen has. And yet, in spite of this very complaint, I actually find Juni Taisen incredibly interesting. 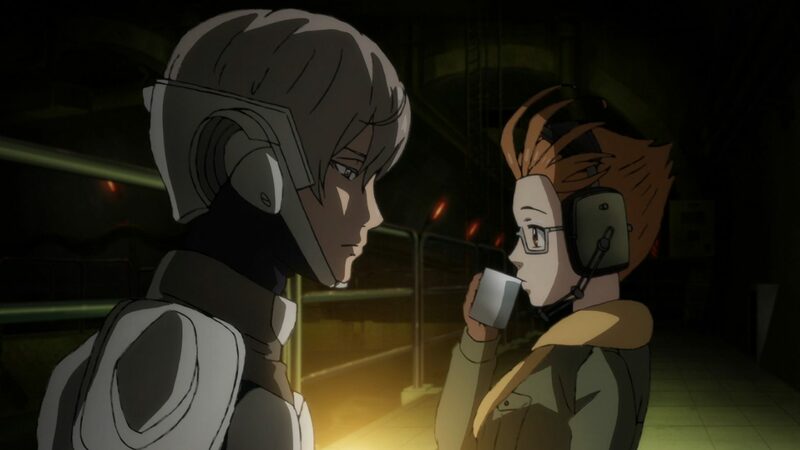 Just a note here that Juni Taisen is by its very nature a series prone to being spoiled, and I’m going to be doing a ton of speculation that has a very good chance of being on the mark. This is your warning to stop reading if you don’t want to be spoiled. Again, I will be spoiling the five episodes of Juni Taisen that have aired, as well as very likely the rest of the story. This is your last chance to turn back if you care about that. All right, so, it’s no secret that there’s a pattern of the characters (with the exception of Snake) dying in reverse order of the animals’ arrival in the Chinese zodiac’s lore. I.e., the boar (who was last to arrive) was the first killed when the fight proper began, the dog (who arrived before the boar) was second, etc. While Monkey and Sheep didn’t die in their character episodes, the pattern is still likely to continue, and that’s reinforced by examining how it’s written through the lens of Survivor edgic of all things. The battle royale format is one I’m very used to, due to the 34 and counting seasons of CBS’s Survivor I’ve seen (and before you ask, yes, it is still on the air). At this point, I’ve seen enough Survivor that I’m usually able to figure out who wins the season long before it’s over. I’m not the only one, of course. There’s a subset of the fan community that goes way back to the early days of the show which focuses on mathematically predicting winners based on something called “edgic,” or “editing + logic.” See, while Survivor is a game, it’s also a serialized television program. The fact that it has a narrative is something that sets reality game shows apart from sporting events or more straightforward game shows like Jeopardy or The Price is Right. And because of the need for the narrative, it’s possible to predict certain results based on narrative devices–meaning that the same principals that guide the editing of a battle royale-styled competition can be used to determine the results of a fictional battle royale. So let’s take a look at how Juni Taisen is going to play out based on Survivor edgic. You can read more about the specifics of edgic here, but the short version is that it’s a system that attempts to pick a winner by measuring three elements for each contestant: their visibility, their relevance to the narrative, and the tone in which they’re presented. The edit can suggest not just a winner, but how someone will ultimately place in general. Let’s take a loot at some of the principals of editing assuming that characters will die in Zodiac order. You can tell fairly early on that certain characters aren’t going to win based on how little visibility they get. Especially notable in this regard are Sheep (who only becomes relevant in the 5th episode), Tiger (who barely appears at all until the very end of the 5th episode), and Dragon (who’s been seen a few times but has been hilariously upstaged the entire show by his brother’s corpse). Basically, the winner has to be someone who’s established early. They might not be a top contender or even relevant to the plot. In fact, while Rat is very likely the winner, he’s had almost no impact on the larger storyline so far. He may not be driving the story (or even riding shotgun), but he’s at least very much in it. In edgic terms, this is the difference between “Under the Radar” and “Invisible.” In Survivor, lying low can get someone to the end very frequently, and depending on a few other factors, win them the game. Players who are invisible may be playing that sort of game (in fact, in his episode, Sheep very clearly noted that he was hoping the major threats would turn on each other), but if they aren’t important in the long run, they’re not going to get the screentime of someone who’s more important. Rat, meanwhile, has been relatively prominent since the first episode. We’re supposed to be more invested in him and what he’s doing because he’s going to be around for a while. Also, note that while Under the Radar and Invisible are edgic terms used to describe “rating,” or narrative relevance, they correlate fairly directly to visibility. Related to the last principal, irrelevant characters must be made relevant before their elimination so that they have some form of closure to their role in the narrative. This was most apparent in the first three episodes, since Boar, Dog, and Rooster were all very much the focus of the episodes in which they died. However, the focus on Sheep after being irrelevant for so long spell his impending doom as well. Okay, this one should be pretty obvious. Rabbit’s not winning. He’s a psychopath. It’s just not satisfying if the bad guy wins. A good villain needs a good fall. The more villainous they are, the more satisfying humiliating their downfall needs to be. To give some examples from Survivor: Johnny Fairplay is one of the most loved villains in the show’s history, most known for having the audacity to fake receiving news about his grandma’s death to gain sympathy from the other players, then continuing to swear on her grave to make his fake promises sound more earnest. He was taken out just shy of the finals by a woman who had been treated by everyone as a worthless, emotional wreck throughout the game, and that opened the door for his archnemesis to land the win. Colton Cumbie, on the other hand, is one of the most loathed villains precisely because he never had a satisfying fall. He ended up playing twice and was taken out of the game the first time by illness and the second time by quitting. He was never voted out or trounced in the finals, so viewers never got that catharsis. Basically, it’s pretty obvious that Rabbit isn’t going to win because he’s the clear villain. But the battle in which he dies is guaranteed to be a big, climactic deal, because otherwise it simply won’t be satisfying. Ironically, the closest thing we have to a hero isn’t winning either. Monkey’s screwed. This is something that’s more the inevitable result of a battle royale structure than any particular narrative device: the favorite rarely wins. The winner has to be a character the audience cares about, but they don’t have to be the only one they like. In fact, in Survivor, the strongest competitors tend to go out in certain places due to how things are structured. Often, once it becomes an individual game rather than a team one, the person targeted is an intimidating alpha male who runs a fair chance of dominating the competition. Roughly halfway through, after things begin to fall into place, is when another big threat usually gets taken out. But it’s right before the finals that the best, most beloved character is usually eliminated. These are characters that are usually built up by the edit in positive ways to keep viewers from identifying a clear winner. It also makes it more shocking when they fall. In Juni Taisen, we’re outright told who the three major players are: Monkey, Rabbit, and Ox. While Rabbit doesn’t fall under this principal due to being a villain and having a different sort of storyline, It fits Monkey perfectly and still fits Ox to an extent. Monkey is being presented as the unambiguous hero of the story. In terms of edgic, her rating throughout most episodes is “Complex Personality” (which no one apart from Rat has fallen into outside of their own episode) and her tone is “Positive.” In a cast where most characters are getting “Neutral” tones at best, she stands out…and that’s exactly why I feel confident that she’s still next to die, despite surviving a full episode past her focus episode. She’s so blatantly the person we’re supposed to like most, which makes her an obvious decoy. Roughly halfway through the season, when anime tends to hit a climax, is the perfect time to kill her off. Ox, meanwhile, has been “Middle of the Road” in terms of rating and neutral in tone. He’s a clear candidate to win, but he’s being shown as more of an unchanging, unflinching force of nature rather than someone we’re supposed to actively support. We’re not supposed to dislike him like we are with Rabbit, but we’re not supposed to like him either. He’s the biggest player, but despite that he’s not a big personality. This is actually really weird in terms of Survivor editing but makes more sense when you account for the difference in their structures. Survivor ends with a jury of the eliminated choosing the winner between the final two (or three, depending on season) rather than a direct clash determining the winner. As a result, the actual finals are fairly anticlimactic as the true climax comes earlier when the biggest two players eliminate their fiercest competitor to secure their win. Ox’s role seems to fit someone who in Survivor would be eliminated right before the finals, but the more neutral tone he’s being given is more in line with a losing finalist. Ignoring the fact that the rat was the first to arrive to the zodiac and that his introductions declare his killing style as “killing all,” you can tell that Rat is the winner because he’s being shown both frequently and evenhandedly. We’re not supposed to fully like him, especially since he’s been seen alongside the more sympathetic Monkey for the majority of the show so far. However, we’re supposed to like him more than the psychopathic Rabbit, the stoic Ox, and the more invisible characters. So yeah, in conclusion, Rat’s the winner. You can trust me on this. I watch Survivor. If the Rat wins then there’s been very little pint to any of this given that would just go back to the original reverse zodiac thing. Admittedly, even without survivor logic, the rat is the only character we’ve spent any time with who from a narrative point of view could win and that’s just kind of depressing. Maybe we’ll get some kind of twist. This comment contains a spoiler, so please stop if you haven’t watched the ending! That being said, you’ve got to feel pretty great about how your prediction played out! Spot on, in fact! Good call!